Alejandra Pablos has been standing up for others as a reproductive and immigrant rights activist for years. 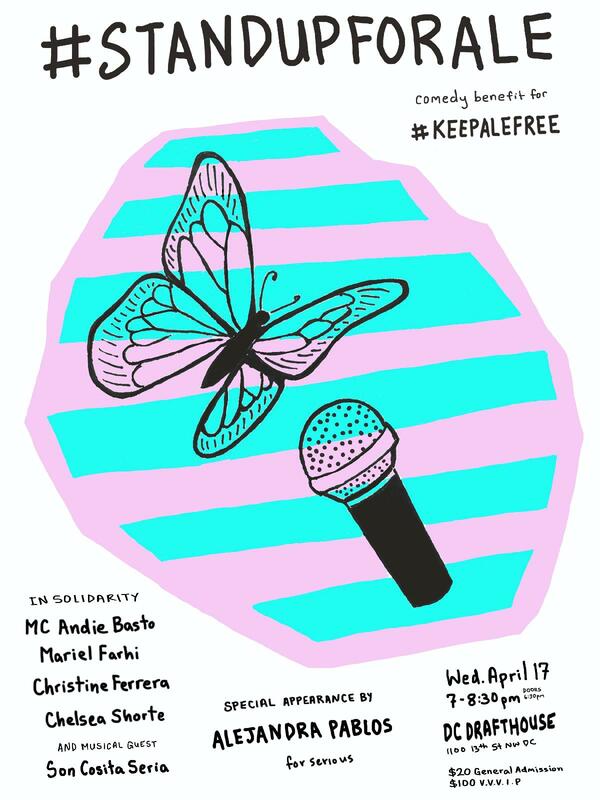 Today we need to stand up for her and raise $50,000 to pay the legal fees necessary to fight her own #keepalefree campaign against an unjust deportation order. More details at www.keepalefree.org. Join a stellar lineup of local performers in a hilarious night of comedy and music, and then hear from Ale herself. Laugh now and donate generously, because deportations aren't funny. All proceeds from ticket sales go to Ale's legal fund. Andie Basto is a proud first-generation queer latina woman and stand-up comedian. As bilingual as she is bisexual, her unique perspective has delighted audiences up and down the East Coast. She was recently featured in Washington Post Magazine, and performed at Mad Ethnic Comedy Festival in Philadelphia. Once a month, she co-produces Jokes That Give Back, an intersectional comedy show for charity at the Drafthouse Comedy Theater in Washington D.C. You can follow her cat's antics on Instagram (@ndie_b) or read her subtweets on Twitter (@ndieIsOnline). Since entering the comedy scene in Baltimore just under a year ago, Mariel Farhi has already made quite a splash. In that short time, she's performed at top venues in the DMV, such as The Big Hunt and the Richmond Funny Bone, and has become a regular host of the Charm City Comedy Project's popular Saturday Night Open Mic. She has performed at the Bechdel Test Fest in Philadelphia, been accepted to the Cape Fear Comedy Festival in Wilmington NC, and was a featured comic in the Washington D.C. show of the Las Culturistas: I Don't Think So Honey LIVE! tour. She draws her inspiration from the surreal and the mundane in equal measure and has been compared to such luminaries as Joan Rivers and Lenny Bruce (by her very supportive family). The granddaughter of Sicilian immigrants who ran Cave of the Winds, the legendary Chicago supper club that hosted touring vaudeville acts, Christine Ferrera creates work in performance, video and painting that explores the intersection of art and comedy. Occupying a unique place in the span of feminist art, her intimate stories begin with a familiar experience and gradually veer into liminal and unpredictable terrain, revealing their emotional core. Christine Ferrera's work has appeared on NPR’s The Story, WYPR’s The Signal and the podcast You/Me/Them/Everybody. She was a featured solo performer in the 2014 Amsterdam Fringe Festival, a 2013 Maryland State Arts Council Individual Artist Award recipient and a 2007 Resident Artist at the Sanskriti Foundation in New Delhi. She has performed at galleries, museums, hotel conference rooms and crawl spaces, internationally. She lives and works and eats and prays and loves in Baltimore, USA. Musical guest Son Cosita Seria Son Cosita Seria was formed in 2008 by a group of friends in Washington, DC who are students of Son Jarocho, traditional music from the southeastern region of Mexivo that combines Spanish, Indigenous, and West African roots. It's traditionally played in community celebrations called fandangos, where musicians come together to play music, sing, and dance zapateado. In recent years there's been a resurgence of Son Jarocho in Veracruz and other parts of Mexico that has spread to communities in the U.S., with new generations learning the music and joining in a movement to preserve these cultural traditions. As part of this the group hosts workshops, uses the music to support local community events, and share the spirit of the fandango with friends and the community in DC.